Residing about 40 minutes from Belvoir, the Open Weekend will run from 10am ? 4pm each day. Come and see the wide selection of new and Secondhand Rifles, Shotguns, optics, accessories and clothing. 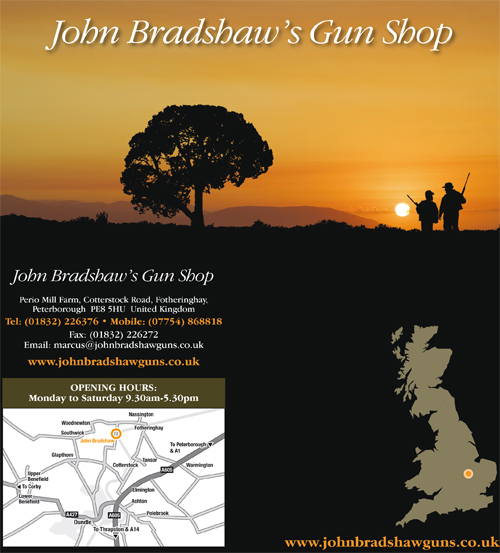 John Bradshaws Gunshop also stocks a large selection of ammunition, rifles by Blaser, Mauser, Tikka, CZ and shotguns by Beretta, Miroku & Browning. Optics experts from Swarovski and Meopta with be here to answer any questions. Also, experts from Edgar Brothers will be on hand, with advice on Remington, Hornady, Hatsan, Zoli and CZ. Ruag will be offering Lightforce and Nightforce products alongside buying advice. Tidepool will be here for all your wildfowling needs and Countrywear Clothing will be there with this seasons clothing lines. There will be refreshments and hot food on hand from Grasmere Farms – all produce is locally reared! There will also be a prizedraw for a shotgun and other prizes. John Bradshaw’s Gunshop looks forward to seeing you!